Florence E. Brock, of Tehachapi, passed away on Jan. 7, 2019. 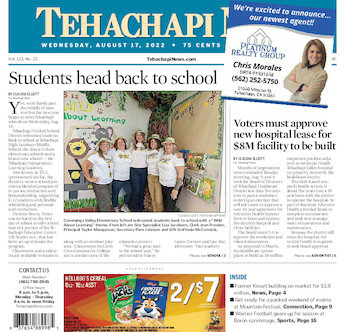 The Brocks were longtime residents of Tehachapi. In 1988, the Brocks bought 26 acres in Bear Valley and moved there in 1997 from Agua Dulce. They built from the ground up their home and planted many Sequoia trees and flowers at “Brock’s Sequoia” on Cumberland Road, just east of Cub Lake. In 2013, the Brocks moved to Mountain Meadows to downsize. Florence’s most precious role in life was being a loving wife, mother, grandmother and great-grandmother. She is preceded in death by her loving son, Dean Allen, her parents and five siblings — Elaine, Lillian, Marie, Richard and Alfred. She is survived by her loving husband of 69 years, Donald, and their three daughters, Donna, Deborah and Denise. She will be laid to rest at the Eternal Valley Memorial Park, 23287 North Sierra Highway, Newhall, CA 91321. A viewing will be held Jan. 22, 2019 at 9 a.m., followed by a funeral at 10 a.m., and committal service at 11 a.m.